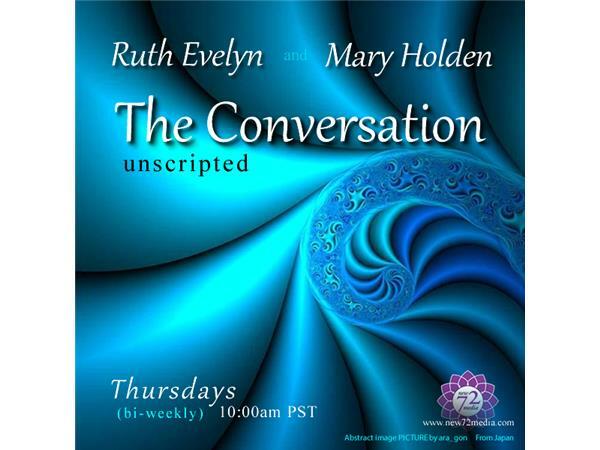 Join Author/Intuitive Ruth Evelyn and Writer/Editor Mary Holden for an engaging conversation of mind-body-mind expansion. As a high channel intuitive, Ruth has consulted and mentored in the business and private sectors in the areas of sustainability, disease cure, personal healing, family relations and more. Mentored by the high realms of Ascension, Ruth works within the Human Holograph to integrate light into the human DNA pattern. The results of her work has provided in-depth knowledge in the language of light, eliminating human emotional pain that no longer pertains to one’s journey and the integration of the true nature of light in the human code. For more information about Ruth, visit her site at www.mycoreconfidence.com and www.ruthevelyn.com. Mary L. Holden is a freelance editor and writer in Phoenix, AZ. All the things she did before 2009 (when she started her business) are a blur except for August 25, 1971 when she met Ruth Evelyn on their first day of high school. Asking questions and listening to the answers she gets is one of her favorite things to do because that's where she gathers material to write. What other people write is also of interest--as an editor her goal is to uphold the voice of the author while assisting them to look great in print. For more information about Mary, visit her site at www.marylholdeneditor.com.